Home > Currency > How do we compare? We regularly compare our costs against the main high street banks in the UK to make sure that our overall price (including bank charges, exchange rates and other fees) is better. With a BIPS account, you’ll be able to get a quote at any time from our online system, which will make it clear to you exactly what exchange rate you’ll be getting. The system updates in real time while the markets are open to reflect the current exchange rates. 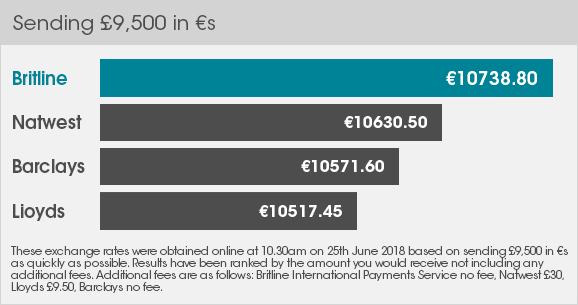 So whether you’re buying or selling a property in France, making mortgage payments, transferring a pension or simply topping up your Britline account, why not put us to the test and see how much you could save. Charges may occasionally be applied by a third party bank when transferring the funds to Britline International Payments Service or before the funds arrive in the recipient account.